The hotel was bustling on New Year's Day. Everything was clean and looked great. The waterpark is smaller than the waterparks I had seen before in Wisconsin Dells, but my kids still had fun. Room was quite warm. Tried to cool with air conditioning but it just ran constantly never reaching desired temperature. Very comfortable. No complaints. As always, love the bed and pillows at Country In. Everyone was pleasant and helpful. The motel was clean and the setup of the room was beautiful. Great place for a few day getaway. Would have liked to see the restaurants open for a bit after the water park closed. Nice hotel with no rush checking out. I got some good sleep and everything was very clean. I wish the hotel had a water fountain along with the ice machine but other than that decent hotel that’s really close to a lot of stores and restaurants and also cedar point. You will find the city of Sandusky in the Sandusky Bay in Ohio, boasting of over 22 miles of beautiful shoreline within the city. Here, you will can enjoy plenty of green areas, stunning nature and parks, in addition to Sandusky’s very interesting historical architecture. It is said that Sandusky actually has the most stunning array of historical architecture in the Midwest. Why not find out for yourself? In addition to the city’s beautiful architecture, your visit to Sandusky is not complete without a trip along the Sandusky Bay Pathway, which is a recreational trail along the waterfront of the city. You will find that the Sandusky waterfront is a popular location in the city, much due to the beautiful views of Lake Erie. Along Lake Erie, and just across the Sandusky Bay, you can plan a stroll through the Marblehead Lighthouse Park. This state park is one of the best-known landmarks in the Lake Erie area and is well worth a trip when you are visiting town. For extra easy access, make sure to stay in a hotel near the Marblehead Lighthouse. In case you are travaling to Sandusky with children, make sure to find an activity your entire family can enjoy! Your best bet here is to spend a day at the African Safari Wildlife Park, where you can treat your loved ones to driving safaris and walking tours around the park. With animals, such as giraffes, kangaroos and camels, your family surely will have a good time. There are also several hotels near the African Safari Wildlife Park for extra easy access. If you are looking for thrills during your visit to Sandusky, do not miss a trip to the Ghostly Manor Thrill Center. This indoor park has a vast array of entertainment like trampolines, bouncy houses, and escape rooms, all mixed together in a massive haunted house. For the thrill seekers, this could be the highlight of your visit, so make sure you book a stay in one of the great hotels near the Ghostly Manor Thrill Center. Should you be planning a trip to Sandusky and are hoping to bring your pet, you are in luck. There are over 30 pet-friendly hotels in Sandusky for you and your four-legged friend to check into. As for those travelling to Sandusky on business, there are also plenty of opportunities. 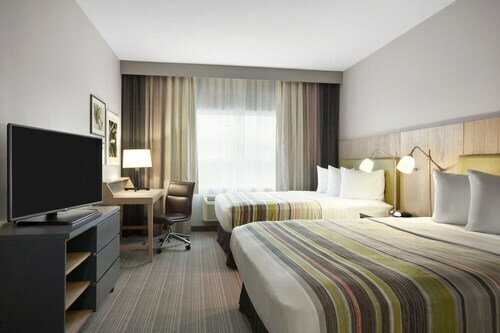 Sandusky is a great location for your conferences and meetings, and after a long day you can unwind in one of the 52 business hotels in Sandusky. There are hotels in Sandusky to fit every need and preference. 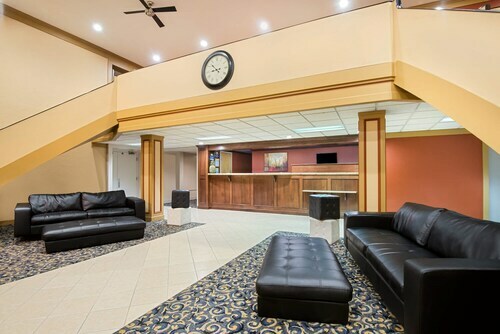 If you wish to stay in one of the 14 3 star hotels in Sandusky, you will find that you can enjoy basic amenities, such as a comfortable bed and a room near the city’s activities without blowing your budget. The Cleveland Hopkins International Airport is only a short drive from Sandusky. It opened back in 1925, and has since served travelers from all over the world. The airport offers flights all across the United States, but also to international destinations, such as Jamaica, Canada, and Mexico. Make sure to book a stay in one of the many hotels near Hopkins International Airport in case you are flying in or out of this airport. Nice staff, great exercise room, pool and hot tub were pretty good, price was wonderful.